Does your soil turn rock hard and crack in the summer heat? Or perhaps it is composed of hard clods of dirt that are almost impossible to break, or is a sandy dust that easily blows away? 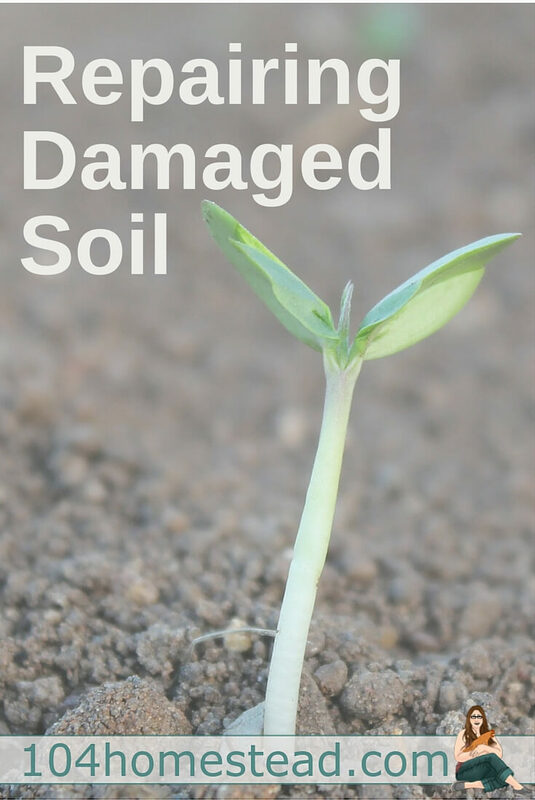 If so, you probably have a case of damaged soil. You are not alone in this problem, as a large majority of North America’s soil has been damaged by poor agriculture and construction practices. 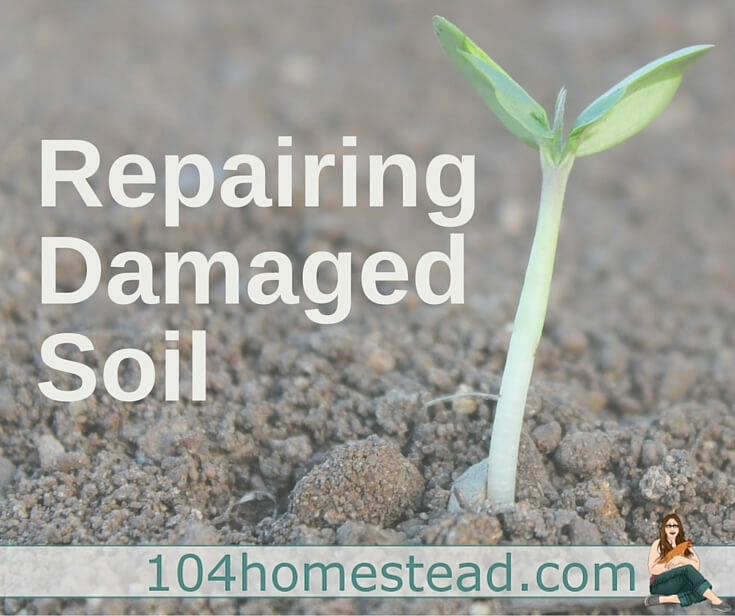 Take heart, though, because repairing damaged soil is not incredibly hard or expensive to accomplish. The first step in repairing damaged soil is to begin adding nutrients and structure back into the ground. This will take you from “dirt” to real “soil”. Some of the best and easiest soil amendments are compost and aged manure (just don’t use cat or dog feces). You can mix up an awesome batch of compost in a month or so, or you can buy it pre-made. Aged manure is easily found at the nearest horse, cow, or rabbit farm near you. Most farms (especially the horse boarding type) are super happy to have you take the manure off their hands! Of course, if you have your own animals, you can make use of their manure instead of sourcing it elsewhere. When you add the compost or manure, you will need to add a LOT of it to make up for the damaged soil. So get as much as you can possibly get your hands on! The best way to add your compost and manure is to apply a “lasagna” style of layering. This is much better for the soil than double digging in the amendments. Start with a layer of newspaper or cardboard, wet it down, and add a thin layer of compost or manure. Then, add a 6-8 inch thick layer of straw or chopped dry leaves, and top with a final thick layer of compost or manure. The next step in repairing damaged soil is to make sure all the lovely nutrients you added don’t get washed away by erosion. In nature, bare soil is never allowed to exist for very long. If a patch of the earth becomes scratched up by an animal or washed bare by a flash flood, weeds quickly grow up and take over the bare soil. We can emulate this principle in our gardens by heavily mulching any bare soil in between our plants. By mulch, I don’t necessarily mean wood chip mulch, although it can be used in a Back to Eden garden. They all work beautifully. I suggest using the one that is most easily accessible in your area of the world. After you have planted your plants or your seeds have sprouted to a decent size, cover any bare ground in between the plants with your mulching material. This will keep weeds from growing as aggressively, help retain moisture, and help prevent your good soil from washing away. During the “off-season” of gardening, make sure your soil is heavily mulched, or grow a “cover crop” to act as a fertilizer as well as hold your soil in place. To do this, simply sow your cover crop of choice, let it grow all winter, then turn it under with a hoe in the early spring. Each one has different soil enriching qualities, and they have varying temperature and climate requirements. Do some research to see which one best suits your soil’s needs. Last, but not least, if lawn chemicals have been used on your soil, you will probably need to test its PH levels. Also, if your soil has oak or pine trees anywhere in the general vicinity, or you are using chopped leaves in your garden, you can just go ahead and assume that your soil is on the acidic side. So, if you find that your soil is a bit on the acidic side, a simple application of inexpensive organic garden lime will work wonders in balancing it out. After applying these simple techniques, you will find your soil much more fruitful and easy to work. As you continue to apply these principles each season, the soil will keep on increasing in nutrients. Eventually you will have completely repaired your damaged soil! What is the state of your soil? Share in the comments below so we can help you repair it. Angi Campbell is a blogger with a mission to help modern day families learn how to get back to basics and live a more simple, self sustainable life. Angi's blog called A Return To Simplicity covers topics related to homesteading, such a gardening, cooking, sustainable living, and her popular DIY projects. I’m not sure pebbles would be a good choice. We do Back to Eden where everything is covered with a thick layer of wood chips. That would keep the pup out and still help build nutrients. You can find more about the technique here. Don’t know why this website downs woodchips! Natural woodchips are a neutral compost that feeds the ground and benefits everything. Been using them for years and totally amazed with every aspect of them. How much longer my plants last and how much healthier they are. It’s a one and done deal. Deep rich, soft soil. Love it! I’m not sure why you think we are against wood chips. I am a huge fan of Back to Eden Gardening. Most of my beds and containers are BTE. Check them out here. Thanks for this article! We have been trying to improve our very sandy soil. Our property was a former gravel pit and the soil is severely lacking in nutrients. Something that is confusing to us is that when we do the soil tests, the results always say the ph is very alkaline. However, we are surrounded by oaks and pines. We have always assumed our soil would be acidic, but the tests are confusing. We’re wondering if the lack of nutrients would have an affect on the ph? We’ve had some success with raised beds and composting for a small garden area, but unfortunately the fruit trees and blueberry bushes are really struggling. You guessed right. Nutrient depletion can cause changes in PH. Also, trees don’t always affect the soil PH as much as people believe. When your soil is repaired and it is able to absorb things like fallen leaves and needles, then the soil may grow more acidic. Good points for gardening. Since we’re lucky enough to live on a family farm we have a small hill near the barn with manure, hay, straw etc. Some of it twenty years old. We have a roto-tiller that hooks to the three point hitch on the tractor and we work it in with that. I’m gonna make the guys work on the yard with it this year, too. New flower beds to combine with veggies! That red clay is slowly beginning to look like real soil! Unfortunately, it’s not enough to treat the fields. Hi Jess and Angi, this is a great article! We have both sandy and clay soil on our property. Our orchard is in a sandy area and our garden is in a clay area. We didn’t plan it that way, it’s just how it worked out. We’ve been working compost into the soil, adding mulch and using cover crops and it is amazing how both the sandy and the clay soil have improved.